So I have picked up archery since learning about my MS. My reasoning is simple, if diet is the most important thing then eating as pure and close to the source as possible is the best. This is my belief and if I stick to that belief I will benefit more than I would if I were to have a belief I did not hold fast to. The mind controls so much of how we process and access nutrients. If I were to believe, and I do, that McDonald's food is poisonous to a degree, then, no matter what I would consume from there would, in fact would actually be poisonous. If I believed it was good for me, I would benefit from it and it would be good for me to a degree. This has so much to do with everything, where your mind is will ultimately dictate what you are going to experience. Trust me, if I do not believe my diet will rid me of my MS, Cancer or any other malady, it won't, but that is not the fault of the diet. If I do not believe, then I will not stick close to the diet and I will tell myself it is the fault of the diet because it is easier to blame than it is to take responsibility. Now back to the archery, I have not yet gone hunting for my own venison but that will come in the fall. 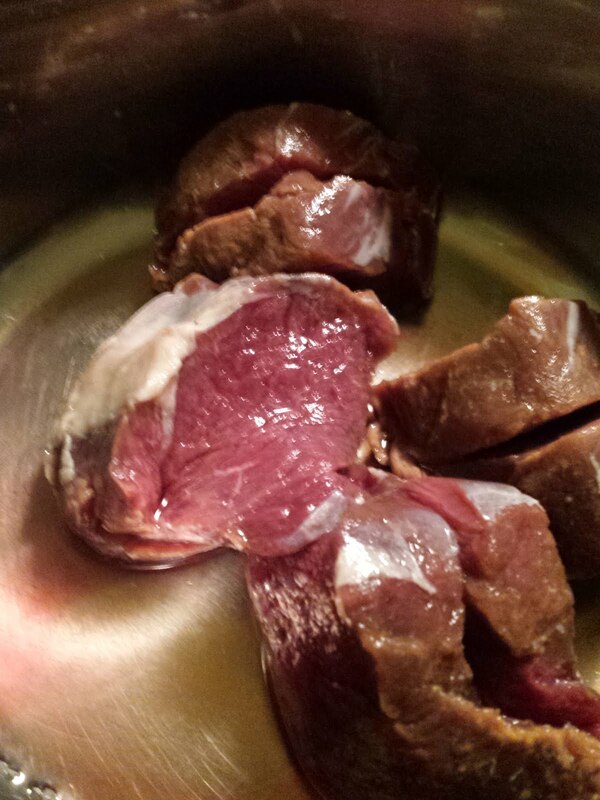 Until then I get my venison from some very generous hunters I am familiar with. 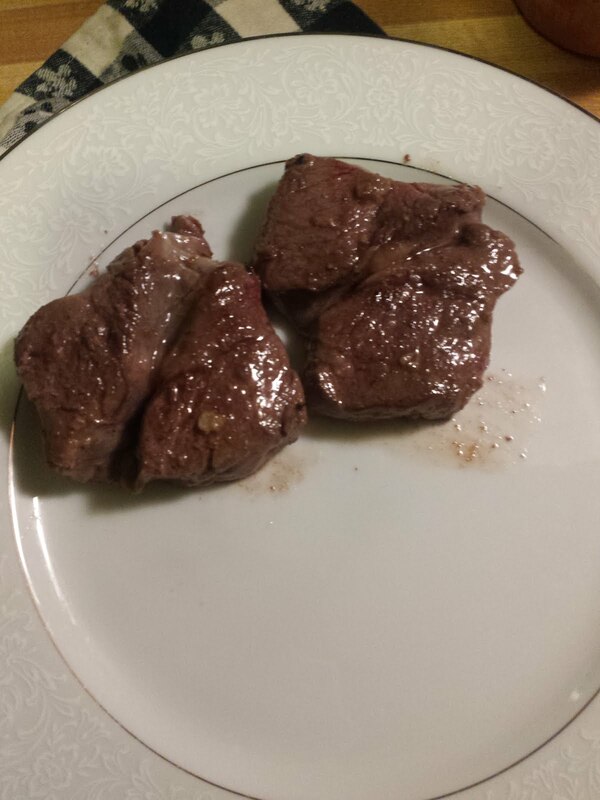 This is a gift and much better, both on my plate and in my body, than any other meat product I can think of. 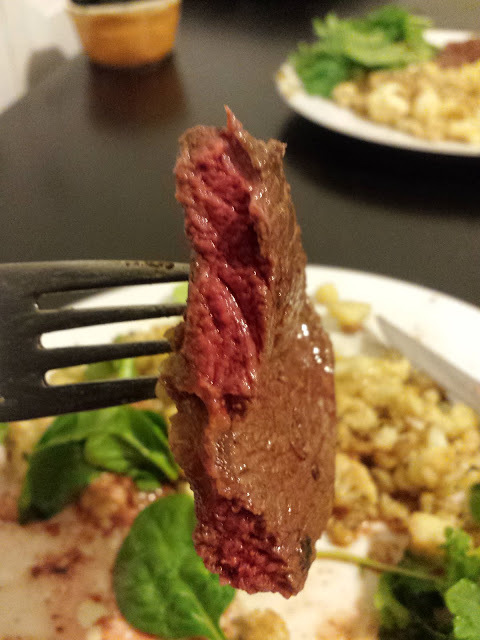 The issue with cooking venison is that it is so lean. Thinking back to the "Fat is Flavor" line when we have lean meats there is a battle between the heat and the meat. If you were to overcook venison and it dries out you have the "gamy" taste everyone complains about. Just like "rubbery" seafood, this is caused by overcooking. With Lean game, when the blood and fat evaporate completely out of the meat you are left with the elements that don't evaporate. 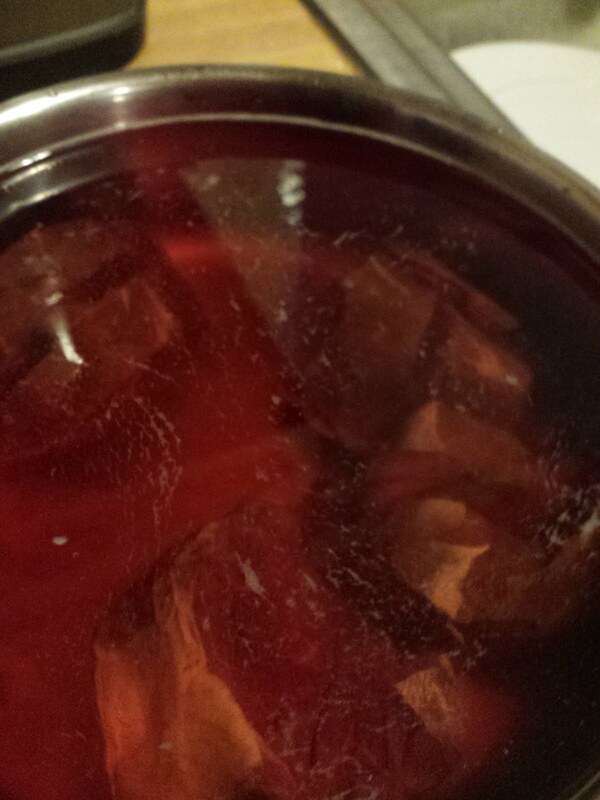 That gamy taste is primarily the iron from the fat and blood. 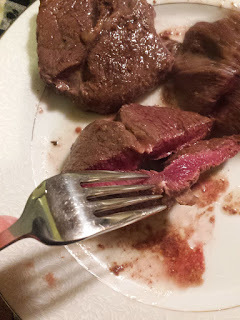 Since the blood and fat are gone when it is overcooked you are left with a tough and very metallic tasting cut, but that is not what venison is at all. 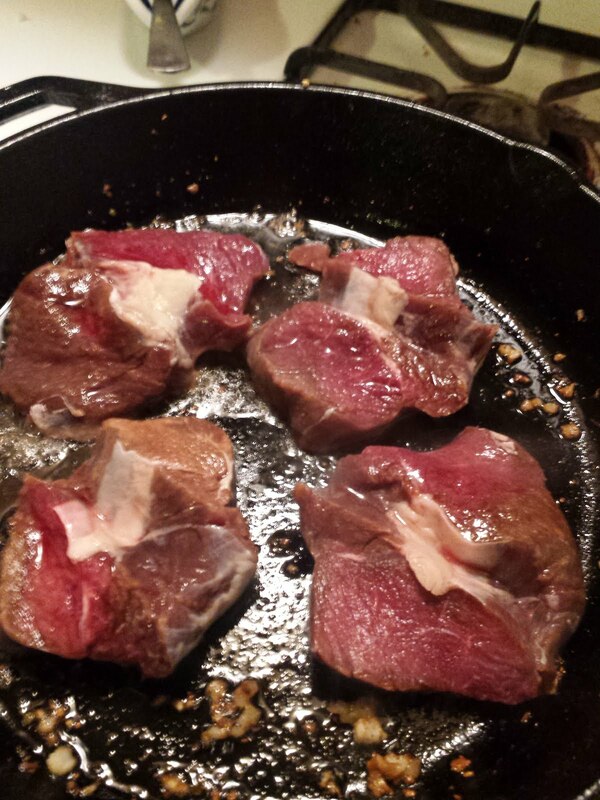 is it a velvety flavorful distinct cut of meat that needs care while preparing. I have a number of butterflied chops I will be preparing today. Because it is so lean I start with a brine this will help the meat retain moister without compromising the structure of the muscle, so as not to get it either mushy or tough. You can get mushy when using a marinade because the purpose of a marinade is to break down penetrate the meat slightly, usually only about 1/4 inch. Penetration with a saltwater brine is much better and doesn't leech any of the fat in the cuts. 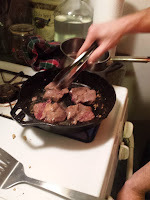 As I do so often I will be cooking in cast iron, I like high heat and rapid movement. Turning the cuts ever 20 - 30 seconds allows the meat to cook from both sides rather than cooking one side then the other. 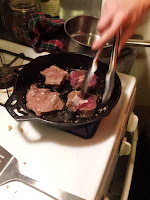 The secret to a well cooked cut of venison is allowing it to "finish" off the heat. If you cook a lot you will know all about the fact that, when you remove something from the cooking source, the center of that which you removed, will continue to rise in temperature. When you have patience, and can become comfortable with removing your meat while it is still slightly more rare than you are looking for, you'll be able to get rich and juicy cuts every time. Venison is one meat that, if you cook it to medium rare, you'll end up with a well done cut by the time you eat it. That's going to give you a gamy taste that has no business on your plate. would eat it I wouldn't serve it.